In their three-plus years in Durham, Head Coach David Cutcliffe and Offensive Line Coach Matt Luke have built the Duke offensive line into what is expected to be a position of strength in 2011. The past two recruiting classes have brought in a very good group of young offensive linemen, and the Blue Devils hope to continue that trend with the class of 2012. 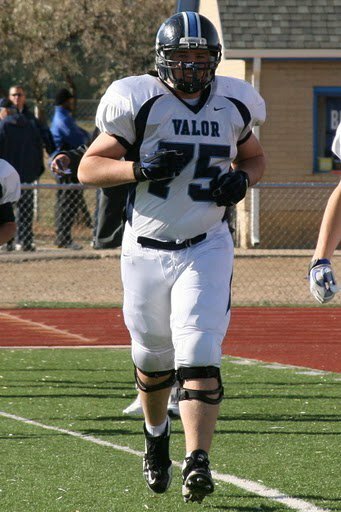 Alex Kozan, a 6’4” 295 pound prospect from Valor Christian in Colorado, is one of the most highly recruited offensive linemen in the country, and the Blue Devils are among the long list of schools he is considering. As a player, I’m smart, I never forget my assignments, I’ve got good quick feet that allows me to stay in good position. Explosiveness off the ball, hand contact, hip movement, that kind of stuff, that’d be my strength. BDN: What are some of the things you have been working on this spring? Pretty much everything, you know, you just work on technique, you’ve always got to work on technique when you’ve been off the game for six months, so you just work on pass technique, run technique, that kind of stuff. BDN: Coming off back-to-back state championships, is a three-peat your goal for your senior year? Definitely, you know we’ve got a strong senior class, we’ve got probably 25 seniors this year. A lot of us have been with the program since our freshman year, our first varsity year when we went 4-6 that year and then won two back-to-back championships, so we’re just trying to get it done for a three-peat this year. Five things. Number one, business program, that’s going to be my major in college, so a good business program. Number two would be coaching staff that I get along with and is going to develop me as a player, send guys to the NFL and send guys to be All-Conference players. Number three is going to be the strength and conditioning program of the team, does it have a good strength and conditioning program? Will they develop me physically, get me bigger, faster, stronger? Number four is whether it’s a place where I can compete, both as a player to start earlier and where I can compete as a team for conference championships, BCS bowl games and national titles. Number five is that I have a strong faith in God, so a place where I can grow that faith and they’re going to be supportive of that. BDN: What schools have you been in contact with the most? On the East Coast, for your region, I’d say North Carolina, Duke, Wake Forest, South Carolina, would kind of be in that area. Up more Northeast would be Pitt, Syracuse and Connecticut. BDN: Have any schools stopped by your practices this spring? We’ve had Syracuse, UConn, I don’t think Duke came out, Wake came out, North Carolina is supposed to come out, I don’t know if they’re still coming. Those are the schools that have come out from the East Coast. BDN: Do you have any visits planned for this spring or summer? I’m still looking at it. I’m going to narrow it down to 7 or 5 by July or August and I’m going to try to visit as many of those schools as I can unofficially, and then a couple of them on official visits if they’re farther away, like schools on the East Coast, to get a better feel for the program. BDN: It sounds like you have a good idea for when you want to narrow things down; do you have an idea for when you would like to make your final decision? I want to take a couple officials, so I’d probably say October. BDN: Is there anything else you think is important for college football fans to know about you? You know, just off the field, I’m going to be a great person, a strong character for the team, I’m going to help the team off the field, I’m not a guy who will get in trouble or anything like that. On the field, I’ll give 110% and people will see that in my game. BDN: Thanks a lot, Alex, and best of luck to you. DURHAM, N.C. – Duke graduate Greg Paulus announced his intention to continue his academic career and pursue his football interests at Syracuse University on Thursday. Paulus, a four-year letterwinner on the Duke basketball team, graduated with a degree in political science with a certificate in markets and management last weekend. 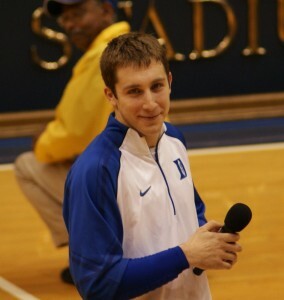 As a member of the Blue Devils’ basketball team, Paulus played in 139 career games and is one of only 20 players to start in 100 contests at Duke. He is also one of 59 Duke players to score over 1,000 career points, ranking 41st all-time with 1,193 career points. Paulus finished his career ranked among the all-time Duke leaders in three-point field goals (8th, 210), three-point field goal attempts (9th, 527), three-point field goal percentage (T-6th, .398), assists (9th, 468) and steals (14th, 172). 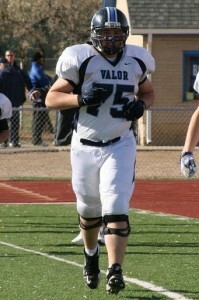 A two-time team captain, Paulus received numerous athletic and academic honors. 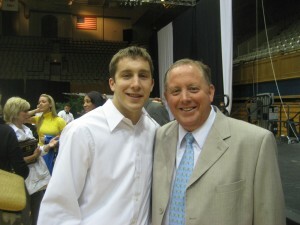 He was a third team All-ACC selection as a junior and made the All-ACC Freshman team in 2005-06. He also was selected to the ACC All-Tournament team as a freshman. His work in the classroom led to being named an ESPN the Magazine third team Academic All-America in 2008 and 2009. Paulus was also named Academic All-District and ACC All-Academic twice in his career. Where do you stand at this point and time? My stance at this time is that I am looking at some different opportunities. There a some opportunities out there involving football and basketball. Right now I am trying to get as much information on those situations as possible. Take it step by step in the process and try to figure out what the best thing for me to do for my future. When did you start to think about football? Was it during the basketball season? No, it wasn't. During the season it was always about basketball and Duke and how we could make a run at the tournament. A few weeks after the season I received some interest from a few people which got me thinking and out there throwing the ball a little bit. And that's what kind of sparked it. I did go to Michigan the other day. I do not have anything set up f or another visit right now. There could be down the road. I am trying to gather information on different schools or options. I do not have any visits set in stone. You know, I do have a good relationship with Coach Robinson. When I was back home in Syracuse I had some friend on the teams anjd went back to practices. I didn't have any communication from him until I got up to Michigan. I had a chance to speak with him and catch up a little bit. But that was the first communication with Coach Robinson. Has it been expressed by Michigan that you are welcome to join? [brief pause] You know what, I had a great visit with them yesterday and both Michigan and myself are just trying to learn about each other and feel out the situation. It's one thing to talk on the phone but another thing to spend a day on the campus and build a relationship with the coaching staff. But there has been an opportunity given there. In reference to Syracuse, I obviously love Syracuse and have lived there a long time, it's home and there has been some interest and something I am looking into. There is nothing set in stone about a visit but I am interested. A couple of days after the season ended for basketball, there was some interest from the Green Bay Packers and we got in touch and set up some workouts. Communication came through and that was when I started to throw again. It was a lot of fun to throw the football around and it was a great opportunity the Green Bay Packers offered And everyday I went out there and threw it got better and better each day. Yeah, there is a number of rules we are trying to follow. I will graduate in May, which is Mothers Day weekend. I am really glad to graduate with some of the opportunities that have presented itself, whether that it with another university, there is different things you have to look into. There is another year of eligibility for me. The research I am doing is pretty extensive and I find the process exciting. It would have to be a Division 1-A program but it cannot be 1-AA. Yeah, yeah. There has been some other interest from the universities and other teams and it's something where I am in the process of building a relationship with those involved. There are options out there and I am listening to them and trying to learn about those opportunities when they present themselves. So you will have to play this season and cannot sit out? How may coaches have been in touch? There have been several other schools that have been in contact. I do not feel comfortable naming them at this point. How important is it to find a situation where you will play right away? I think one of the things when looking at a situation involving a school is that you want to help the program. You want an opportunity if you help them to go to grad school. I think that having an opportunity to compete and play right away is very attractive to me. If this is the route chosen, I think that will be a major factor. Has there bee contact from other NFL teams? There has been several other contacts from the NFL. Once again, I don't feel comfortable naming those, but there has been several other teams who have been in contact or called. We are in the process of trying to gather the information to work something out. If there is an NFL team that calls and wants to see me throw. I'll be glad to get out there and show them what I can do. You know what, I'm a huge, huge fan of Coach Cutcliffe. I am a big fan of him and what he is doing and have a lot of friends on the team. If I play the game of football, I can only see myself as a quarterback and that's one of things I want to do if that is the best option and in my heart that's what I want to do - be a quarterback. I'm a little surprised. There have been some really great opportunities that have come up in the last couple of weeks and I am very appreciative of all those things which have come my way. I know that the Duke coaching staff here and some other people. It's an honor to have an opportunity to continue to play and kind of keep that going. It's been a dream not only to play Duke Basketball but continue towards a professional level. If you could being the professional ranks would be another dream come true. To have all these opportunities is very exciting and I feel fortunate because of them. So it is surprising but it's also exciting.